The thing about “experiential learning” is, there is no alternative to it if you are meaning to make a sound manager out of yourself. At Vignana Jyothi Institute of Management (VJIM), Hyderabad theories are backed with veteran experts’ inputs in the field to complete the concepts for students, better. It is in sync to this that Finance specialization students currently attended a workshop with professionals from Karvy Stock Broking Ltd. that opened a whole new dimension of understanding the nitty-gritty of the financial world and stock- better! The two days’ workshop on “Student Engagement and Applied Learning in Finance” was scheduled for 11thand 12th December, 2017. 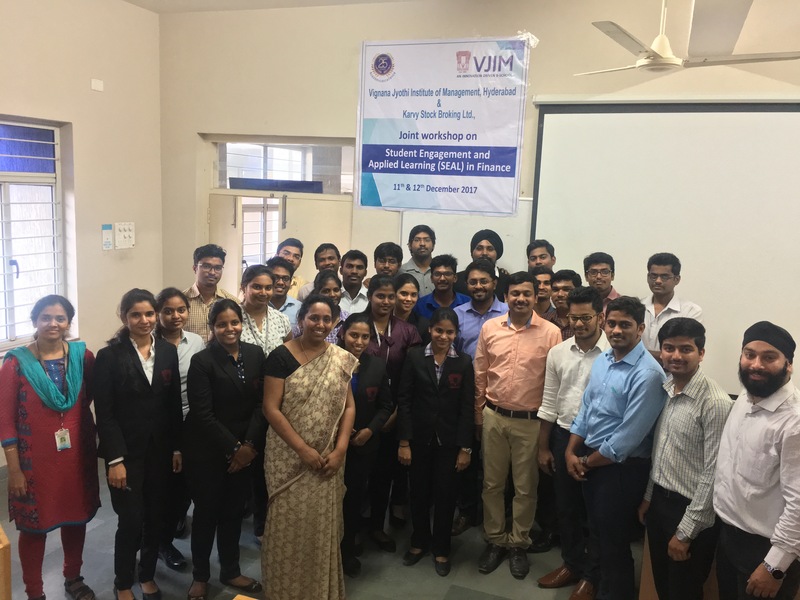 VJIM PGDM students enthusiastic about completing their Diploma in Financial Management got a complete insight into the basic concepts of stock market and how s/he could make their way into the stock market and build on their own investment profiles. On the first day of the workshop, students were introduced to the basic concepts of stock markets and various kinds of securities that are traded in the market. Day two of the workshop saw a further detailed conceptualisation of capital markets and corporate actions. The Karvy Stock Broking Ltd. professionals designed the workshop in ways to give practical exposure to the students on how one can be an investor and make proper investment decisions. Students were also taught how they can analyze a company’s performance and make their own investment portfolios. “The two days’ workshop has been very insightful for all of us finance enthusiasts. These workshops solve for bridging the gap between the classroom and the industry and we get to pick crucial components of various functions directly from professionals working within the space. I could literally relate my theories to the activities given to us,” says one of the students attending the event.